With PTV you have a strong and competent partner at your side. We look back on 40 years of experience in the field of digital mapping and work closely with leading data suppliers. Therefore, we are able to offer you the necessary knowledge as well as high-quality solutions and services to solve your geographical and logistical applications even better and thereby, to optimise logistics processes. Storm and strong winds, heavy rain and hail, snowfall and black ice: Extreme weather can impact road conditions drastically. Should your drivers reduce their speed? Should you plan an alternative route to avoid steeply ascending highways? PTV xServer enables dispatchers to consider the weather in their planning and warns them if a planned route crosses a bad weather front. This enables them to change planned routes if necessary and inform customers of impending delays. Driving behaviour has a direct impact on the risk of getting into an accident. Especially when weather and road conditions are poor, caution must be taken. With PTV xServer, data on speed, acceleration, braking behaviour, fuel consumption and other factors connected to driving behaviour can be gathered via the drivers’ onboard unit and sent directly to insurers. This way, insurance companies are given a tool to evaluate policies and claims under consideration of driving behaviour. 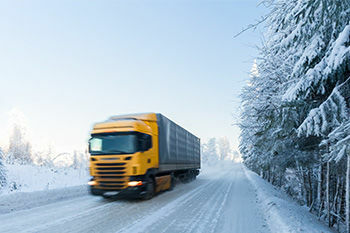 Fleet operators, in turn, who consider weather warnings and have their drivers drive according to agreed-upon KPIs can benefit from reduced insurance policies. We aim to provide you with market-leading solutions at all times. Therefore, we work with well-known maps providers such as HERE and TomTom. Data acquired externally is checked, processed and enhanced with additional information - for example truck-specific hydrographs or transit bans for commercial vehicles. As a user of our maps web services you can be sure that you are always planning your routes based on the most detailed and up-to-date information. Our maps allow zooming, fading in and out individual elements and storing points of interest (POIs). By using them, you can ensure that all relevant geodata is optimally visualised for your applications. Of course, all maps and data can also be used on corresponding mobile and navigation devices. We provide you with additional data that we either collect ourselves or purchase from third parties and enhance with our own data records. These data records include truck attributes, truck-specific hydrographs, dynamic traffic information, historical traffic data, information on tolls and environmental zones or market data such as purchasing power and sales potential. The use of our precise and diverse data enables you to make your planning even more realistic and robust. Read more about customised and ready-to-use maps and data for logistics we offer. Like our customers, we operate worldwide and offer high geographical map coverage at maximum detail. If a requested geography is not available in our standard delivery data, the PTV subsidiary DDS Digital Data Services GmbH is able to supply suitable maps and data. We provide the map data in common and uniform formats. This guarantees their compatibility with all PTV products and their integration into other existing system landscapes. To facilitate the integration of our maps and data into your software, we offer a state-of-the-art software development kit (SKD) with numerous programming interfaces (APIs). If desired, you can host the data on your own servers or use our cloud solution. Would you like to integrate our APIs into an SAP landscape and use them on the familiar interface? Use our SAP Business Connectors for simple and fast integration.